Clapham woods, and the equally haunted Chanctonbury Ring are in close proximity to each other in haunted Sussex, England. 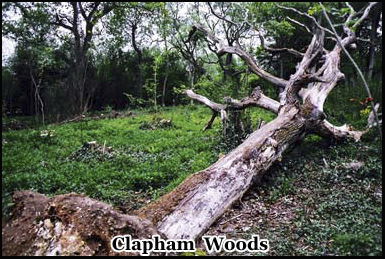 Clapham Woods has been the location of numerous UFO sightings, paranormal activity and unexplained murders dating back to the 1970’s. Both the woods and Chanctonbury ring have been linked with possible cult activity and are believed to be sites of dark mystical powers. 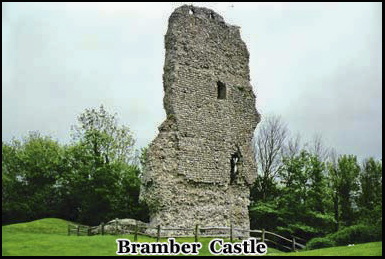 Bramber castle lies to the East where the crumbling ruins are haunted by ghostly apparitions. Clapham village is a small country community not far from one of the main roads leading to the seaside town of Worthing. I arrived there at about 2 pm in the afternoon, it was a spring day, and the sky was slightly overcast, but there were still several hours of daylight left. Due to the woods being associated with a satanic cult I had chosen a date that was prominent in the occult calendar in this instance April 30th which is also known as Walpurgis or Beltane night. About half a mile from the exit of the A27 motorway there is a barely noticeable sign that says Clapham, there are only two short streets that lead to the village, both of which dead end .I made the turn and followed the second road around to the left as it led up a slight hill through the center of what are a few dozen houses a village shop and a church. For the majority of people there are few reasons to go here unless this is where you happen live. It is also clearly one of those places that everyone knows everyone, and a strange car in the village is something that doesn’t go unnoticed. The road is fairly narrow and people’s houses line either side of it, so you do feel as if you are somewhat of an intruder if you are not a resident. It’s unlikely that the villagers enjoy the negative attention their village receives because of it’s association with the supposed cult activity and in particular the accusations that they are not only aware of it but are maintaining a conspiracy of silence. 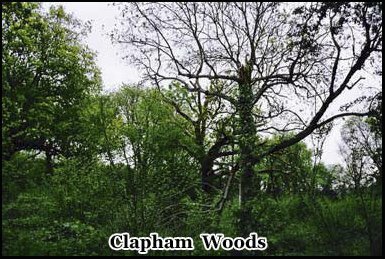 Whether there is any truth in it or not, it has made Clapham Woods a destination for ghost hunters, UFO watchers and thrill seekers for many years. I drove s lowly down the single track lane for about 1/4 of a mile until I came to a turn off to the left that leads to the parish church. Ahead the road dead ends, and to the right is another track that stops at field a few hundred yards away down an incline. There are woods on either side of the village and both are supposed to be paranormally active. I headed up the track towards the Church, in front of it is a small gravel parking area. On one side is a large tree and to the left there are a series of trails that lead off into the woods. There were no other cars here when I arrived, but the area is popular with dog walkers and hikers and once a week people from the surrounding parishes still come here to attend Sunday Mass. You feel even more conspicuous when you are carrying both a camera and a camcorder, and don’t have a dog to walk. It is definitely a place where at least in the daytime you can not go unnoticed. I walked through the entrance to the graveyard beside what is the Church of St Mary‘s, and around to the rear of the building where there is a gap in the hedge. Clapham woods has been investigated many times by paranormal researchers in search of the legends of haunted Sussex, and the suggested path to get through to the densest part of the woods is by cutting through the rear of the church and across the adjoining field. There are a few cows in there grazing at the far end, and it’s about a 10 minute walk towards the perimeter at the far side. 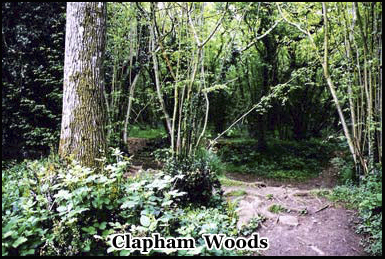 The mysterious history of Clapham woods dates back to the 60’s and involves Ghosts, UFO sightings and Devil worship. There have also been several murders in the area. Clapham is a small sparsely populated village in the Sussex countryside, far away from any major cities, so any crime seems more shocking when it takes place in such a tranquil setting. The first of the murders occurred in 1972 when a police officer by the name of Peter Goldsmith disappeared and his body wasn’t discovered until 6 months later when it was found hidden under some brambles. Several years after that in 1978 a former Vicar of Clapham, Neil Schnelling disappeared on Halloween, and his body lay undiscovered for 3 years. In July 1981 a women by the name of Jillian Mathews went missing and she was later found raped and murdered in the woods. During this time period there were accounts of animals disappearing, and dog owners reported that their pets seemed to be afraid to enter the area. In 1987 a book was written by a researcher called Charles Walker who had been monitoring the strange activities in the woods for several years. In the book he claimed that they were being used by a satanic cult called the Friends of Hecate, who it was suggested were responsible for the disappearances of the animals and possibly the murders. The release of the book sparked considerable interest in the area by the national press, which was intensified by reported UFO sightings and story’s of motorists passing by on the nearby A27 claiming to be overcome by some unseen force. A few years ago these woods in haunted Sussex were the subject of an investigation by an English paranormal TV show called Scream Team, whose cast spent the night alone in one of the surrounding fields. This and coverage received on the internet as well as in newspaper articles and publications such as the Fortean Times sparked a renewed interest in the paranormal aspects of Clapham village. After a few minutes I had reached the other side of the field where in the left hand corner there is a locked gate that leads to the woods. I lowered my camera equipment behind the gate and climbed over before heading off into them. There were now trees either side of me and there is certainly a strange atmosphere about the area as much of the sunlight becomes blocked out. Behind me there is a narrow path to the left that leads back to the area in front of the Church, ahead through another gate and across a few more fields and there is what is known as t he altar tree. The altar tree is one of the places where occult rituals have taken place. It is not easy to find, but after about fifteen minutes the track splits and a short distance down the left hand fork there is another turn off to the left that leads to it. So far I hadn’t run into anyone else in the area, it is very quiet although as you get closer to the road you can hear the occasional car pass by. There is another way to enter the woods instead of via the village, which is via a long path that leads up an open field from the roadside, which may be a less conspicuous way to take particularly at night. The part of the woods where I am now are very secluded and in the center is one tree that is far larger then the others which I assume must be the alter tree. It is a huge old oak tree with knotted branches that reach through the woods. What is somewhat unusual is that in this part of the forest you don’t hear a lot of the sounds that you may expect, there are no birds singing, no trees rustling, and no sounds from any wildlife that may inhabit the hedgerows. It’s as if this part of the woods has been deserted and the silence seems very unnatural. I walked up to the base of the tree, the trunk is several feet in diameter and I should imagine the tree has stood here for hundreds of years. I peered upwards into its overhanging branches, what I was looking for was any signs that it had been used for any sort of ritual purpose. I couldn’t see anything out of the ordinary about it, so I started to look around its base. Within a few minutes I had come across the rotted remains of a tree trunk that had burn marks upon it and there was also the remnant of melted wax, it didn’t look that recent but a few feet away I also found what was a ribbon tied around a rotted branch that was lying nearby. Both of these discoveries did indicate that the area had been used for some sort of ritual or occult activity. I couldn’t tell what color the ribbon originally was as it looked like it had been washed out by the rain so again it probably wasn’t placed there that recently. Somewhere near the altar tree there is also supposed to be a stump which has a Pentagram carved on it, but after searching for several minutes I couldn’t locate it. You can’t be seen from the road here, there are no houses around and you are unlikely to be disturbed by anyone. This and the areas already mysterious reputation is one of the reasons that Clapham Woods in haunted Sussex continues to attract not just paranormal investigators and UFO researchers but also those with much darker motives. Several miles to the North is Chanctonbury Ring, this Iron Age Hill fort is also meant to be the location of possible satanic worship. The famous occultist Alistair Crowley actually referred to it as being a place of great dark power. Clapham Woods, Chanctonbury Ring and another nearby Iron Age hill fort known as Fissbury ring are all supposed to be linked by a mystical triangle of ley lines. A few miles to the west is Bramber castle which is haunted by the ghosts of several murdered children, and all of this gives the area a strange and mysterious feel to it. Although there is a somewhat claustrophobic aura about this part of the forest, the most paranormally active part of the woods is back across the other side of the village. I stood in the shadows beneath the trees for a few minutes a nd then began to retrace my steps back along the path in the direction I entered from. On my return journey instead of cutting back across the open field that leads to the church I continued back along the path and then into the woods on the left hand side. There is a narrow track that leads through the trees, and several smaller tracks that branch off through the undergrowth. On one side are green shrubs on the other side huge oak trees. The track continues for a few hundred feet, and then there is a fork, I took the right hand path that circles round back to the Church. There are twists and turns in the path that make it impossible to see around the next bend. It is very quiet, you again the sounds of birds singing is strangely absent. The foliage become very dense as you make your way through, the track splits again to the left and then on the right hand side it opens up to an area of open ground, where there are a few fallen trees scattered among the long grass. I left the path and walked across to the far side where there is a shallow crater in the ground several feet across, in which nothing appeared to be growing. There are a few legends about the crater, one is that it was caused by a bomb dropped during World War 2, another is that it was actually a UFO landing site. I took a few pictures, and at that point a car pulled up in front of the church opposite me, but it was just someone here to walk their dog. One of the mystery’s surrounding Clapham woods during the 70’s was that a large number of dogs disappeared and it was suspected that they may have been used as sacrifice to the Goddess Hecate who was supposed to be a central figure in the cult activity that had taken place in the area. Hecate is a mythical three headed goddess of the underworld and one of her heads was that of dog. You certainly feel self-conscious taking pictures when it’s fairly obvious that they are certainly not wildlife photographs. I left the car parked in front of the church and proceed on foot back down the track that crossed over the road through the village center. I was headed to an area of the woods referred to as the Chestnuts, this also happens to be at a crossroads, which were at one time believed to have the power to ward of evil spirit’s. After the main road the track narrows and then after about 5 more minutes you come to an open field. I kept to the left hand side, and about 3/4 of the way across the ground gradually slopes up towards a hedgerow at the far end. Beyond that there is a small gap in the fence that leads to the woods. Once you exit the field there is some open ground and a slight hill that levels off as it reaches the trees. Here there are several more paths that lead through the woods, one branch’s off to the left the other continues onward. Although still quiet at this point you start to hear noises in the bushes, but I assume this to be squirrels or maybe pheasants that I have disturbed as I make my way through the forest. The path isn’t very wide and it curves around so that you can’t see very far ahead, but eventually it opens up into a small clearing. As I got closer I could see that the path is intersected by another path to form a crossroads which indicates that this is the area that is referred to as the Chestnuts. It is here that people have experienced unexplained nausea as well as feelings of being watched, some campers once reported seeing a black shape materialize in front of them and others have felt sudden temperature drops. I am now at the center of the crossroads, ahead of me the track eventually leads to a lay by near the A27 motorway. To the right within a few hundred yards the intersecting track runs along side a dead end road just outside the center of Clapham Village. I headed off to the left where the woods are most dense. I followed what was one of several paths that split from the main track until I came to a water filled ditch, and I could go no further. I retraced my steps back towards the crossroads. Just down a turnoff to the left is what appears to be some sort of man made hide, there were several branches that had been cut off and tied between the lower sections of two adjoining trees to form a roof. I’m not sure of its use, whether someone had been using it to observe some of the local wildlife or if someone had been camping here recently. If you continue past the hide and on down the track under the trees there is a drainage ditch that is surrounded by a wall of old tires, at this point the sky is almost completely obscured by the overhanging trees. I circled back around through the woods, to the crossroads. Much of the track had been churned into mud after a recent rainfall and you can clearly see hoof prints where horse riders had been. I would be returning her later tonight so after about 10 minutes I decided to head back to the car. I retraced my steps, back through the woods across the field and up the track leading to the church. 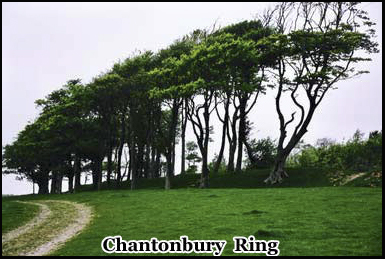 Next stop on my journey through haunted Sussex was Chanctonbury ring. Chanctonbury ring, an Iron Age hill fort is several miles away from Clapham Woods but it has been suggested that there is some sort of mystical link between the two. I headed north on the A287 and after about a 20 minute drive the road turns back towards Worthing and there is a sign up head pointing to Chanctonbury ring on the right hand side. At the end of a narrow lane there is a small car park and beyond that there is a steep hill that towers over the surrounding countryside, along its ridge is a line of trees, behind which is the South Downs. The ring itself is to the right on the crest of the hill, it is here the earthen remains of an Iron Age hill fort dating back to the 5th and 6th century is outlined by the trees. The ring has also been the location of UFO sightings, paranormal occurrences and possible cult activity. It is believed to have a bad metaphysical aura about it; and there is also some evidence that it was once used as a Roman Temple. A few miles to the south is Fissbury ring, another Iron age Hill fort. It is believed that between Chanctonbury Ring, Cissbury Ring and Clapham woods that some sort of mystical triangle of ley lines has been formed that attracts U.F.Os and causes paranormal events to occur. Near the bottom of the hill just past the car park is a farm and an old cottage, aside from that the area is uninhabited. Just beyond, the road ends at a pathway and you have to begin your descent to the top of the hill on foot. It is actually a far longer hike, and more strenuous then it first appears. The trail is a step often rutted dirt track, through a dark overhang of trees. It slopes up and to the left of the hill, which means that once you get to the top you have to cut back all the way across to the right to get to the ring itself. It was probably about half an hour of fairly constant uphill walking before I could see a gap in the distance to where the path opens up to the level ground at the top. By the time you have reached this point you are almost 800 feet above sea level. Once you are there you have the whole of haunted Sussex stretched out before you and in the far distance you can see the sea and the beach at Worthing. I rested for a few minutes then headed back across the top of the hill. There is a gravel path that weaves through the grass on the top of the hill, it takes you past a water trough and cattle grid and then you are on the final stretch towards the ring. The ring itself is actually more oval in shape, and outlined with a line of trees, but it seems somewhat out of place on top of the otherwise flat landscape. The area is far more isolated then Clapham woods, but from so high up you have a clear unobstructed view of the sky and the countryside for miles around. On the right I can now see down into the valley below, and the farmhouse and the car park seem small in the distance. I’m now just a few yards from the outer perimeter of the ring, behind the trees there is now a raised earth bank that runs around the top of this section of the hill. It is almost 500 feet long and 400 feet wide, only a few of the original trees that where planted upon it remain as many where destroyed during a fierce storm that ripped through Southern England in 1987. There is now a low wire fence around the rings inner core, and behind it are the trees that were replanted in the aftermath. They are in various stages of growth and although it has been several years since the storm, you can still see the massive damage it caused. But it will be many years before the trees reach the proportions of those that didn’t get damaged or uprooted. Originally there weren’t any trees around the ring at all, but in 1760 a local man by the name of Charles Goring planted an outline of beach trees to mark its location. I headed clockwise to the south side of the embankment. Although more popular on the weekends Chantonbury is certainly not that accessible, and I haven’t seen anyone else since I left the car almost an hour ago. It was during the 60’s and 70’s that the UFO sightings and paranormal activity in the area were at there peak, but even before that the ring was thought of as a mysterious place with a sinister reputation. 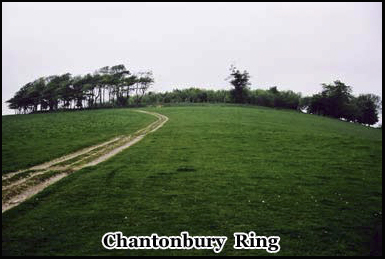 One of the legends surrounding Chantonbury Ring, is that if you walk backwards around it seven times then the Devil would appear. In 1977 the site was excavated and some of the items discovered here were the remains of ancient animal bones mainly of sheep and oxen which were believed to indicate that ritual sacrifices took place here when it was a Roman Temple. More recently in 1979 an altar was found in the shape of a 5 pointed star and there have been other indications that it has been used for occult practices. As I reached the back of the ring there was an opening in the fence. I cut across part way into its centre stepping over rotted tree branches and through a thick undergrowth of leaves and shrubbery. It’s incredibly still and quiet inside, and there is definitely a strange feeling about the area, as if you are not alone. Although the ring is on the top of the hill today there is very little wind, but like Clapham Woods there are no bird sounds as you may expect. Its extreme isolation makes it still possible to picture the Roman soldiers that were once stationed here, and its position on top of the hill would have meant that it would have been easy to spot and then defend against any would be attackers. I made my way through the center of the ring before cutting back across to the surrounding earth bank through another opening several yards down from the first one. I continued to circle around to the front. The track around the ring curves up and down as it cuts through the trees, to one side the ground drops away fairly sharply and far below you can see fields and farmland. I was now almost at the point where I had started and I headed on back around to the path that I has entered on. It was a major detour to go across to the far end of the hill as I had done to get here, but I had noticed a small wooden gate in the fence on one side of the field that looked like it may be an alternate route back down. Beyond the gate was a track through the woods which although it was a far more direct way to the bottom of the hill was also very step, its actually so step that once you start your descent , the only way to stop is to try and grab a fence post or tree branch to stop yourself falling over. By the time your about a 1/4 of the way down its beyond the point of no return and you just have to try to struggle to stay upright all the way to the bottom where it intersects with the main path. If anyone does visit Chanctonbury, although it saved about fifteen minutes I really wouldn’t recommend this route. I was soon back at the road that led past the farmhouse to the car park. While I was in the area I was also going to make a detour to the haunted ruins of Bramber Castle which is just a few miles away towards Worthing. After that it would be several more hours before it got dark and I would be returning to the epicenter of haunted Sussex and Clapham Woods. 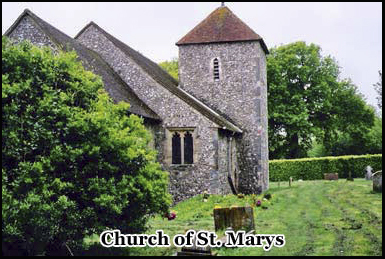 In the village of Bramber there is a small parish church and behind it are the ruins of an old castle. To get to them you cross a small bridge over what once was the moat. The remains consist of large broken sections of the outer walls and a semi intact section that was once a bell tower. The castle is haunted by the ghosts of what were the children of the man that originally built the castle in the 13th William De Braose. It was during the reign of King John that De Braose fell out of the monarchs favor. To keep him in line the king insisted that he give up his four children to be imprisoned until he was satisfied that De Braose would no longer be an inconvenience to him. But De Braose became aware of his plan and tried to flee the country but before he could do so he was caught. His 4 children were held in Windsor Castle and as punishment King John saw that they starved to death as an example to others that disobeyed him. 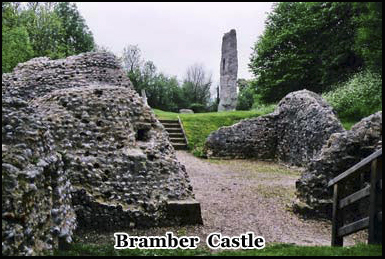 It is the ghosts of the children that are said to have returned to Bramber Castle. You can still trace its perimete r, and walk within large parts of the thick defensive walls. There are still a few sections of the inner chambers that remain and although most of what still stands is at ground level at the front near the entrance is part of the bell tower which is actually about 40 feet high. I explored the castle grounds for about half an hour and by the time I headed back to the car; it was just after 5 o’clock. There were still a few more hours before it got dark. To kill time I visited the nearby seaside town of Worthing, and then at about 9pm I headed back towards Clapham Woods. The village itself doesn’t have a pub and the only place close by where you can find something to eat is a Little Chief restaurant just off the motorway exit. I had dinner there and by that time it was 10.30pm and dark. I was going back to the area known as the Chestnuts, as out of the two locations that are supposed to be most paranormally active it is the easiest to get to. I didn’t drive into the village this time but parked the car in the layby next to the entrance to the path that leads through the woods and to the crossroads that I had been to earlier in the day. At this time of night there are few cars on the road, and I doubted I would run into anyone in the woods this late in the evening. I began my walk along the path and although it wasn’t pitch black as soon as you begin to get further along it get noticeably darker as the trees that line either side rise up above you. I shone the flashlight ahead of me, scanning the beam from left to right. Although sound carry’s further at nighttime, the silence was almost total until somewhere off in the woods on the right I began to hear what sounded like twigs being broken as if someone was walking on them. I stopped for a moment and switched the flashlight off; it took a few seconds for my eyes to adjust to the darkness. I listened for about a minute as the sounds also stopped and then began again but were fainter then they had been before. There are deer, badgers and foxes that live in the woods and come out at night when there are less people about, so I came to the conclusion that this is probably what I had heard. I switched on the flashlight again and headed towards the crossroads. As you get nearer to the intersection you can’t see to the left of the right of the paths that cross it, and ahead the path curves around into the darkness so you really can’t see much beyond a few yards. The entrance to the woods is now several hundred yards behind me. One thing about being in the semi darkness is that your hearing does become more focused, as your vision becomes more confined. I can actually see very little, just silhouettes of trees and faint shadows just beyond the range of the flashlight, which disappear as soon as the beam becomes brighter as you get closer to them. The sky is slightly overcast but there is still the faint flow of moonlight and stars. I was now right at the center of the crossroads. I stopped and listened, this time everything was still. I shone the flashlight slowly in an arc from the left, circling round to the right and then back up towards the end of the path I had just walked down as far as the beam would allow. It was now about 11 pm. I switched off the flashlight again and waited for about another five minutes. After a while your vision fully adjusts and you can make out the silhouettes of the trees and bushes around you, there are also many shadows and shapes that your mind could make out to be all sorts of things if you let it. It was time to return to the car. I walked back up the path glancing behind me every few yards just in case I wasn’t the only one out and about that night. As I got to the end of track I peered back into the woods one last time, shining the flash light towards the crossroads, scanning the beam from side to side until it faded out about half way along. There is certainly a strange aura about these woods, but then most woods at night have a sense of foreboding about them. But not every wood has stories of UFO sightings, satanic cults, multiple murders and reports of paranormal phenomena dating back almost 30 years. I returned to my car, having no doubt that whatever mystery’s these woods hold will continue to attract the curious to haunted Sussex for many more years to come. Hey Buddy!, I found this information for you: "Haunted Sussex – Clapham Wood’s, Chanctonbury Ring And Bramber Castle". Here is the website link: https://www.chasingmidnight.com/haunted-sussex-clapham-woods-chanctonbury-ring. Thank you.